Summon: Draw a Dwemer from your discard pile and give it +2/+2. 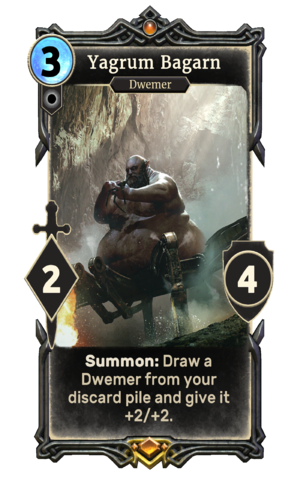 Yagrum Bagarn is a unique legendary Neutral creature card. It is part of the Houses of Morrowind expansion. "Greetings, from the last living dwarf." "To be reduced to violence at my age!" The card's summon ability applies the Master Crafted card effect. Yagrum Bagarn first appeared in Morrowind, and the name of the Master Crafted card effect alludes to Bagarn's former occupation as Master Crafter. This page was last modified on 2 March 2019, at 00:50.